Defend this poorly placed base from the marauding tanks and bandit gunners as they attack the armor cache from all sides. 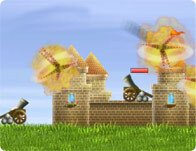 Upgrade your tank's weaponry and defenses as they cross the threshold into the range of your turrets. Build up your base and squash any raiders stupid enough to test your defenses. Use your mouse to aim and fire. Use WASD to move.